Sisu Vikas Samiti strives to prevent deprived children from being exploited as child labour. Though established in 1984, Sisu Vikas Samiti was non-operational for the past several years and has been revived recently in FY10-11. The organisation works in three blocks namely Bangriposi block, Kuliana block, and Baripada block of Mayurbhanj district of North Orissa.The aim is to rescue child labourers, orphans and destitute children from villages in these blocks. The organisation rescued around 14 children of which three were put up for adoption. However, due to absence of government recognition for the shelter home, these children were not allowed to be retained by Sisu Vikas Samiti. The matter has been taken up by Government of India and until a decision is taken, 11 children have been sent to their families or nearest relatives. The children for adoption had been temporarily referred to registered adoption centre of the state government. A sponsorship project to reduce school dropout rates is yet another initiative of Sisu Vikas Samiti. Under this project, the organisation staff identifies needy children and provides educational kits such as notebooks, pencils, crayons, and rulers. The organisation has reached out to 21 schools and supported 316 children of which 306 are girls. Programmes such as World Health Day, Micro Insurance Training and seminars on How to come out of water crises etc. are also organised for the benefit of Society. 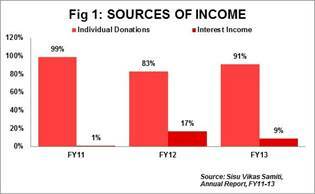 Individual Donations: Individual donations account for 91% (Rs0.2mn) of total income in FY13. However, the donations have declined from Rs0.6mn in FY11 to Rs0.2mn in FY13 in absolute terms. This decline is the result of non-availability of funds due to closure of shelter home. (Ref Fig.1). Total Expenses: Expenses totalled Rs92,866 in FY13 with programme expenses (including salaries) accounting for 38% of total expenses. 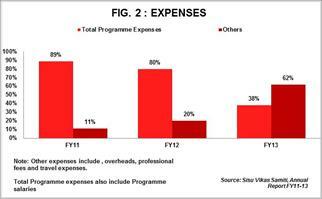 Expenses on programme activities have reduced from Rs95,000 in FY12 to Rs5,000 in FY13. The reduction is on account of closure of shelter home as the major chunk of the programme expenses were incurred on the shelter home. Travel Expenses: Expenses on travel have increased from 11% (Rs20,122) in FY12 to 31% (Rs28,923) of total expenses in FY13. The organisation’s scope of work includes travelling to remote villages. Travel cost also includes travel expenses for training programmes attended by board members. Overheads: Overheads account for 15% (Rs13,000) of total expenses in FY13. In absolute terms, overheads in FY13 have decreased by 10% from FY12 indicating effective utilisation of funds. Professional fees: Fees to professionals increased from Rs1,463 in FY12 to Rs12,280 in FY13. These include fees paid to consultants for fund raising and other legal expenses as required under Juvenile Justice (Care and Protection of Children) Act, 2000. (Ref Fig.2). Investments: Investments account for 98% of total assets and includes corpus fund for land and building invested in fixed deposits. Income Growth: The NGO posted total income of Rs0.3mn in FY13. The NGO recorded an income growth of 38% in FY13 as compared to negative growth of 62.7% in FY12. The fluctuation in growth rate is on account of irregular individual donations which form significant portion of its total income. Funds utilisation ratio: The ratio indicates ability of a NGO to utilise funds received for programme activities. Sisu Vikas Samiti utilised 100% of its funds received in FY13 for the purpose of programme activities. Self-sufficiency ratio: The ratio was 334% in FY13. Self-sufficiency ratio indicates ability of an organisation to meet expenses from its own funds. Own funds include individual donations, beneficiary fees and other income. In FY13, 91% of total income for the NGO was funded by individual donations. Funding: Non availability of adequate funding restricts the NGO from expanding its scope of work. Government support: Sisu Vikas Samiti is unable to run the shelter home due to absence of government approval which is on hold. Sisu Vikas Samiti is of the opinion that the government employees responsible for this programme lack accountability and a positive mindset. The Governing Board of Sisu Vikas Samiti consists of members who have a legal background. The organisation has filed petitions on various issues of public interest. The Board meets five times a year to discuss functioning of the organisation. Sisu Vikas Samiti is a listed member of GiveIndia and GuideStar India.